If any event teaches you how to perform on no sleep, it’s a hurricane. Oh, and the dramatics of weather channels was just too much! The first rule of hurricane coverage is that every broadcast must begin with palm trees bending in the wind. Well, it has been a while since I lasted posted a recipe, but it has been a very busy time for all of us here in coastal Carolina both before and after hurricane Florence…I really haven’t had much time to sit down and come up with anything, but I have been cooking the whole entire time, but a lack of enthusiasm and inspiration was on the back burners. So I sit and munch on apples from the orchards of the Virginia mountains while I ponder my Ruth Reichl recipe to share with the club I offer this fabulous fish dish…Enjoy, but I must say the apples from Virginia are fantastic and I need to find just the right recipe to show them off, but for the moment I am enjoying a nice juicy one while I get this post ready to post. So today after taking a peek at the cooking club’s theme and new guest chef Ruth Reichl and while I have a few dishes to consider I have chosen to start off with a recipe for a glazed cod recipe from the Kendall Jackson site for a dinner that Ruth attended and was the special guest. The fish recipe is rather easy and yes, I did stray from the corn pudding that the fish was served with instead making a lightly smoked corn grits recipe of my own. The pan roasted corn can be made stove top or in a cast iron skillet in the oven, I chose stove top today’s recipe and used about 1 cup of corn kernels, a tablespoon of EVOO, 1/4-1/2 teaspoon smoked paprika, minced onions, a piece of seeded jalapeno, minced and about a tablespoon of butter added into the finished corn. 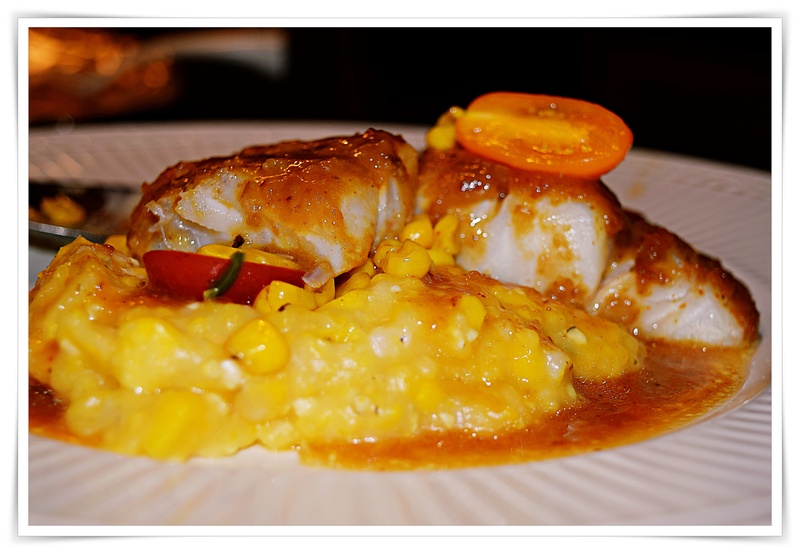 Use half the corn in your grits recipe and save the rest to garnish the plated grits and fish. I tossed the halved grape tomatoes into the remaining corn in the pan and heated it again to warm the tomatoes. In a small saucepan, add the wine and raisins. Bring to a boil and then reduce to a simmer, cook for 5 minutes. Remove from heat and add the zest of the whole lemon and juice of half. Place in a blender and carefully purée until smooth. Set aside. Glaze can be refrigerated for up to 1 week or frozen for up to 1 month. Line a small sheet pan with nonstick aluminum foil and rub with butter. Place the cod in the pan and season with salt, pepper, and Slap Ya Mama seasoning if using. Drizzle the fillets with 1 tablespoon of Chardonnay glaze and place the pan in the oven. Bake for 12 minutes (if using a convection oven, check for doneness at 8 minutes).